Recently I was asked if I was ever going to do reviews on ciders. “Of course”, I said. So here I go Gabriel’s Superstore to pick up a few different ciders since I didn’t have any. 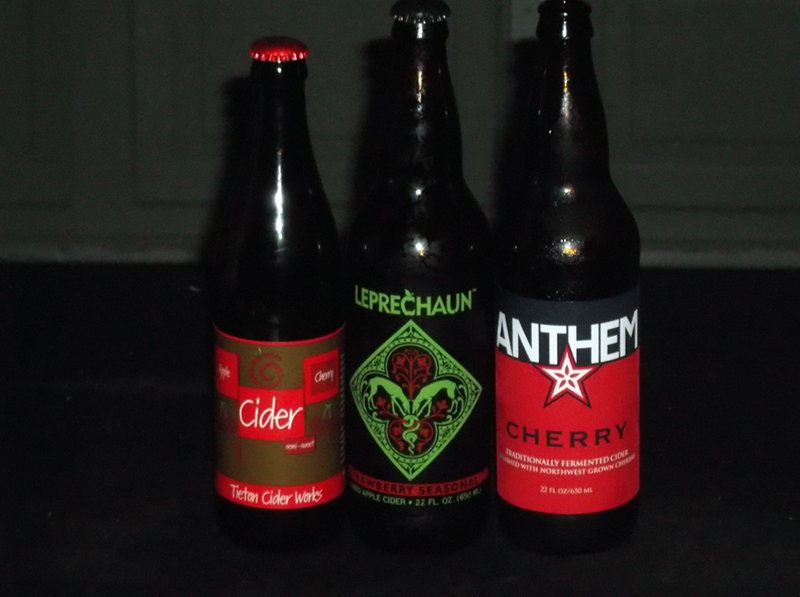 I picked up three different ciders and I dedicated my Saturday night to drinking and reviewing these ciders. I think I have only had 2 other ciders before this. Ok, so here we go, onto Cider Saturday! Here we are starting Cider Saturday at the Garage of Beer and Metal with this little gem of a cider by Tieton Cider Works out of Washington. This is my first review of a cider on the website, so I hope I get all the points I’m supposed to here. I used my Jester King snifter glass for this one, the cider poured a a bright red color with a finger width white, slightly pink bubbly head which quickly became just a thin ring line leaving little to no lacing down the glass. I am finding this cider really easy to drink, and it’s going down really quickly. Is this a good thing or bad? I guess we shall see in a while. The aroma is similar to a dry red wine, with hints of apple. The cherries really stand out in the smell. The taste is exactly the same as the aroma, very red wine like. This has a very smooth mouth feel at first, and leaves a dry feeling in your throat. 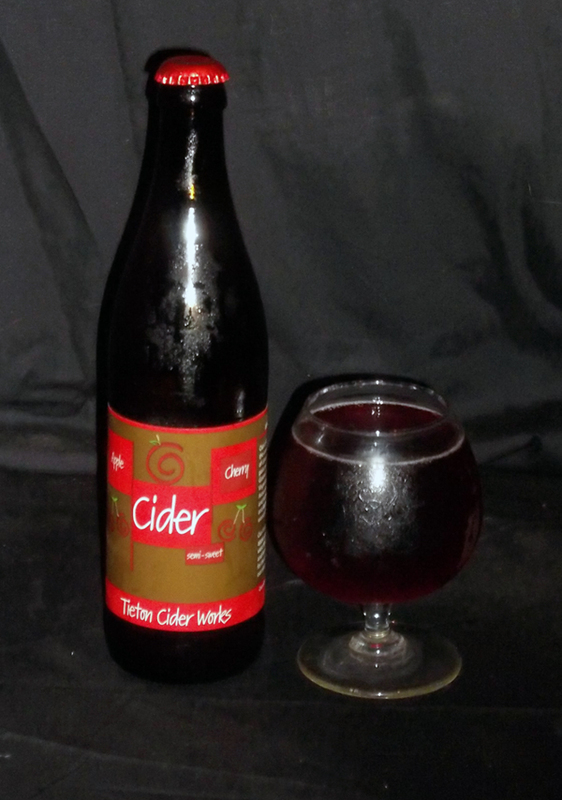 I will definitely drink this cider again, and I look forward to trying other ciders by Tieton Cider Works. As for my music pairing, I chose the band HIGH ON FIRE and the song “Ethereal” from their 2007 album, Death is this Communion. How did I come to chose this band, and song to pair with a cider you ask? The answer is simple. This is what was playing on my mp3 player at the time of drinking. No real big reason. But it was cool jamming out to this song while downing this delicious cider. Second cider of the night, got a slight buzz from the first. I think I drank it too fast. Well here we have a Texas based company bringing ciders to the masses. 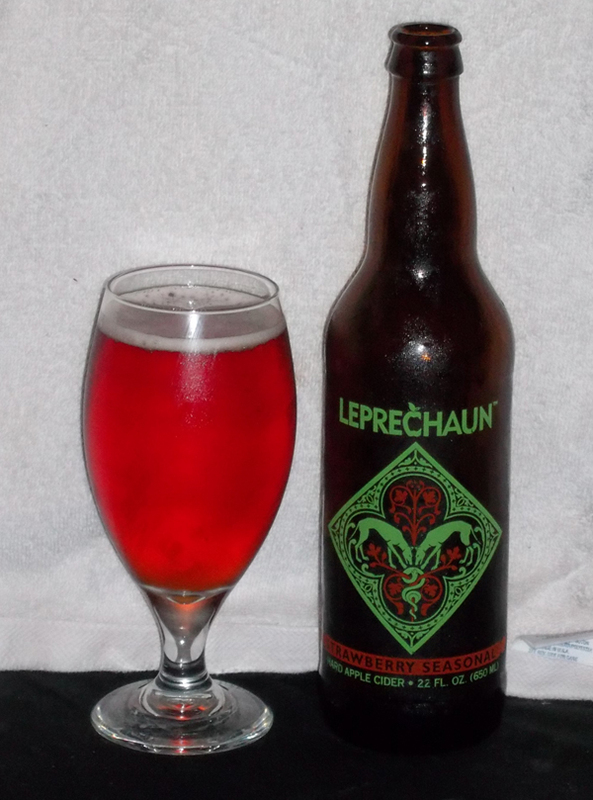 This is actually my second encounter with Leprechaun, as I had their Pomegranate cider once. I love strawberries and was really looking forward to this one. I poured into a porter-stout style glass. The cider was a bright light red color with a white head that stayed leaving a good layer of lacing down the glass. There were a lot of carbonation bubbles rising for quite some time. Aroma of green apples, strawberries, and red wine. Not much else going on here. Taste of pureed strawberries, with an apple backbone. Slight stinging tartness in the after taste. Very sweet and sugary. Sweet sugar feelings on lips is left after taking a drink. Very strange thing going on here. I feel as if I have been kissing a girl with lipstick or that I have been drinking from a glass with lipstick on there. I am doing neither, I promise. Its a bit different, and I’m not sure if I would drink this one again, which is weird cause I love strawberries. Not really working for me in this cider. Tart and dry leaving me the urge to grind my teeth a bit. Music pairing I went with The Gathering, with the song “Gemini I” from their latest album Disclosure, released in 2012. I know a lot of people who say when they were a Death/Doom band, they were at their best, and others will say that their career with their ex-singer, Anneke Van Giersbergen was their best years. Well I say their entire career from beginning to present time is their best. Every album is great. I really love all albums, and even the newer ones with their new vocalist, Silje Wergeland. I needed a soft song that was good enough to raise my spirits after having a not so pleasant experience with the drink! My final cider for the night, and I have to say I am pretty happy about that fact! Not sure if I will ever do another cider night. Maybe one every no and then, but never more than that. I miss my beer! 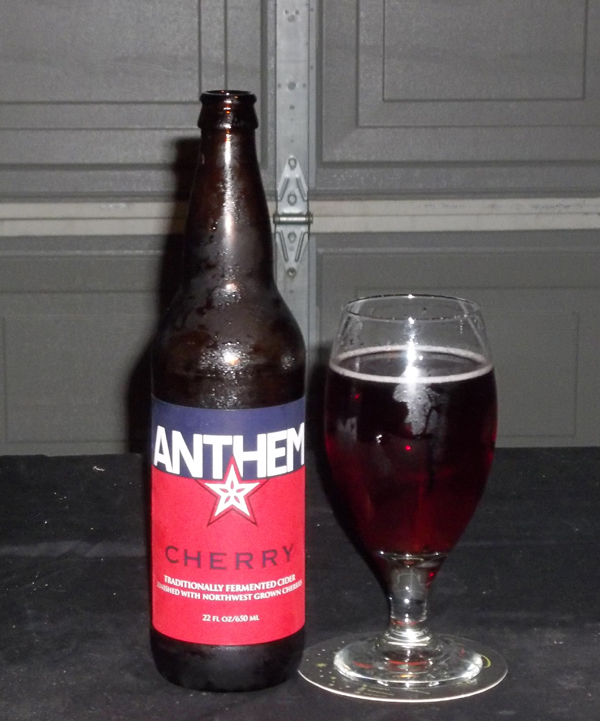 I have had another Anthem cider before, when I tried their Anthem Hops, which is a cider that was dry hopped with Cascasde hops. Poured into a porter-stout glass, the cider was a dark red wine color with a thin white head, which quickly disappeared, leaving no lacing on the glass. The aroma once again has nothing special other than the smell of cheap red wine, with an apple backbone. This one did have a bit of a medicinal smell. Taste was again nothing special. I thought was drinking the Tieton Cherry Cider again. I know a lot of people say that beer all tastes the same, but we craft beer lovers know that isn’t the truth. But, seriously, all ciders tastes the same!!! Metal, please save me from this… IMMOLATION to the rescue. Ahhhhh, back to my comfort zone. Overall, I will say this again…I MISS MY BEER, and I really don’t see the need for several cider companies. So if you have never had a cider before, go get one, and you’ve had them all! Now where did I put my beer! Next ›BMD on Tour: Guadalupe Brewing Co. & Faust Brewing Co.